The 2012 Kentucky Agricultural Summit focused on the next generation of farmers and the possible challenges they could face. In tandem with the two-day conference at the Kentucky Exposition Center, a five-year strategic plan for Kentucky agriculture was approved by a task force that has worked many months to develop it. 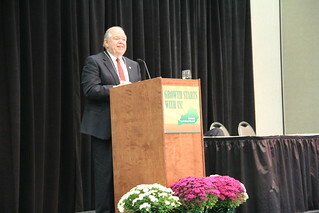 During the first day of the Kentucky Ag Summit, Agriculture Commissioner Johnson from Tennessee was the guest speaker. KFB was among the Summit sponsors. KFB President Mark Haney was a task force member. Many other KFB leaders, as well as some staff members, were involved in the process, which involved a series of public meetings and the work of several committees assigned to particular topics. The Kentucky Agricultural Council, an umbrella group representing more than 80 organizations, directed the project and conducted the Ag Summit. The strategic plan, which will be presented to Governor Steve Beshear and the General Assembly, involves seven areas of emphasis: (1) Ideas to encourage the next generation of farmers (2) the identification and development of new marketing opportunities. (3) Regional agricultural and rural community development. (4) Agricultural Education. (5) Consumer education and outreach. (6) Government policies, initiatives and programs. (7) Policymaker education and outreach. The detailed plan has dozens of specific recommendations for action under those seven areas of emphasis. The Summit kicked off with addresses from Agriculture Commissioner James Comer and his counterpart in Tennessee, Julius Johnson, the longtime chief administrator for Tennessee Farm Bureau. Tennessee Governor Bill Haslam appointed Johnson to the post in 2011. Johnson, who spent 37 years with Tennessee FB, told the Kentuckians that he was enthusiastic about the future of farming because the anticipated growth in world population will drive up the demand for food production. He said he is also encouraged by how contemporary agriculture has found room for such a wide variety of farming operations. “One size doesn’t fit all,” he said. Among the challenges he cited for future farmers was to communicate with the general public about what they do. “Eight five percent of our citizens are two generations removed the farm; we must continue to put a face on agriculture,” Johnson added. A panel that discussed elements of the strategic plan included Brent Cornett, who is chairman of KFB’s Young Farmer Advisory Council. House Agriculture Committee Chairman Tom McKee and Senate Ag Committee Chairman David Givens also were in the discussion. Fayette County FB President Todd Clark and Calloway County FB President Sharon Furches were co-chaired the task force along with Keith Rogers, a former president of Hardin County FB. Clark also is President of the Council for Burley Tobacco while Mrs. Furches is President of Kentucky Women in Agriculture. Rogers is Executive Director of the Kentucky 4-H Foundation.